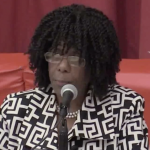 Just hours after it came to light that Jersey City Superintendent of Schools Dr. Marcia Lyles is suing the school district and the local teachers union, the board of education voted to terminate her and appointed a temporary replacement. The board voted 7-1(1), with Trustee Matt Schapiro voting no, and outgoing Trustee Amy DeGise abstaining on the vote to fire Lyles at last night’s regularly scheduled meeting, ending a tumultuous January for the school district. 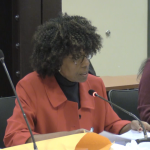 Lyles was not in attendance for yesterday’s vote, instead fellow administrator Jason Bing sat in her place. Fifteen minutes after the meeting began, Board of Education President Sudhan Thomas asked Bing if Lyles would be appearing, but he responded that she told him that she was sick and asked him to represent the administration. 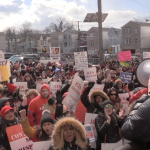 The firing marks the end of a long-standing feud between Lyles and the Jersey City Education Association, as well as differences over policy objectives with board members since she was hired in 2012. Lyles contract still runs through June 30, 2020 and as it stands now, taxpayers will still be on the hook for at least her $231,000 annual base salary. In an interview after the vote, JCEA President Ron Greco said succinctly that he was “not surprised,” declining to comment further. Greco has been one of Lyles most outspoken critics, announcing yesterday, less than an hour after the superintendent’s lawsuit had hit the media, that the JCEA had issued a vote of no confidence for Lyles and was calling for her resignation. 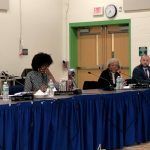 On the other hand, Schapiro, a strong supporter of the superintendent, expressed regret and disappointment with the board’s vote to oust Lyles. “I am flummoxed. It really has been a very strange month and strange year, I think that there’s been an extraordinary number of actions taken by this board that defies explanations and has not been shown to be based on evidence,” he stated. 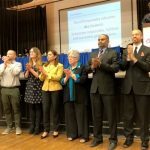 The board had gone into executive session at approximately 8:30 p.m. and said it would return by 9:00 p.m., but board members didn’t return to their seats on the stage at the auditorium of Public School No. 26 until 9:30 p.m.
As soon as the board reconvened the meeting, Trustee Mussab Ali introduced the resolution to terminate Lyles. 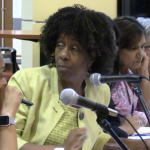 BOE President Sudhan Thomas said the board’s overwhelming vote to terminate Lyles represents their desire to turn around a school system that is facing a major funding deficit heading into the 2019-2020 scholastic year. “I think that gives you a sense of the sentiments and feelings on this board, and I think there’s been much deliberations and listening in the few past weeks. Today’s ‘President’s Report’ details 20 of my top inferences over the last five years. Five years ago the school district had $72 million in its fund balance, and last year when the budget was presented to us we had $200,000 in the budget and a $70 million deficit,” Thomas said. Trustee Marilyn Roman, who introduced the resolution at the January 2 board meeting not to renew Lyles contract, an action that Dr. Lyles described as “illegal” in the lawsuit, told us in an interview last week that since her tenure began in 2012, student test scores have been “abominable,” and millions of dollars have been spent on testing student achievement without satisfactory outcomes. “No matter how you slice the data; if you take the same group of students who started in 3rd grade and see where they are now in 6th, 7th or 8th grade, you can literally track their progress and see the progress that they’ve made,” said Schapiro. For now, Lyles will be replaced by Associate Superintendent Franklin Walker. His new title will technically be chief district administrator. The move was predictably welcomed by the members of the JCEA in attendance, including Greco. 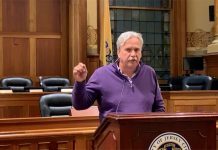 “He grew up in Jersey City, Ferris High School graduate, ballplayer, teacher, physical education, supervisor, vice principal, principal, associate superintendent,” he began.